In our family, animals always played an important role. They were members of our family, guardians of our nights, and confidants during our dark days. There were three that Debbie and I shared together throughout childhood and on into adulthood. Now these three were quite different from one another. Emily was truly Debbie’s dog. She was a beautiful husky with the sweetest personality of all time. 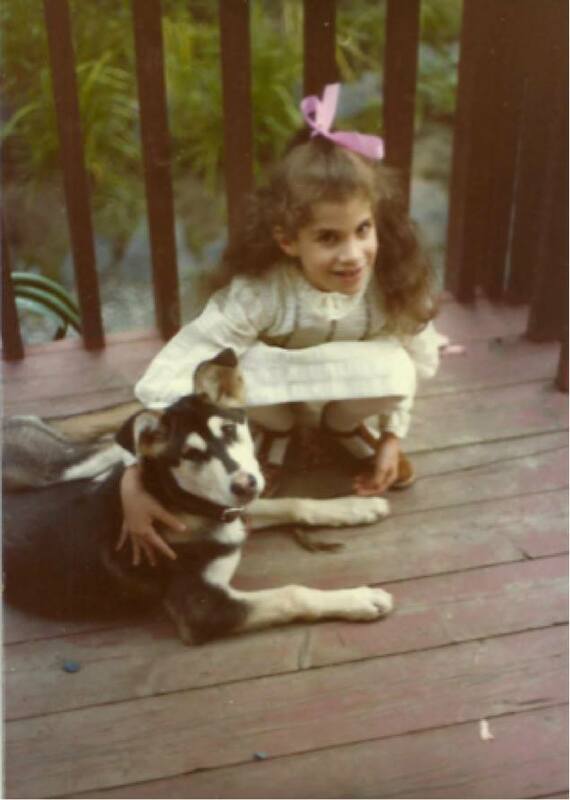 Debbie begged Dad to let her get a dog from the box of a lady sitting and giving away dogs if I remember the story correctly…. in, of all places, but in the mall parking lot. Thus every dog owners story begins. I wonder how many new companion stories begin with what would be the first of many…”begs” so to speak. Haha, ok, did I only crack myself up there? Hmmm. Who knows the story Peter Pan? And who remembers the character Nanna? She was one of my favorite characters in that film. She was a gallant, kind, and clever dog who watched over the Darling children. I had a Nanna in my life too you see. And it was Emily. We have photographs of her sitting on the edge of my pink baby blanket. Me a blob of sweetness and black hair sitting and looking up at the camera, with Emily guarding my every move. Our mom says that when I was super tiny she would lay in the door way of my bedroom. If I would move, moan, or dare I say cry, she’d go sauntering into mom and dad’s room, nuzzle mom awake in order to come take care of me. Perhaps that’s why I had trouble sleeping years later. Subliminally, I missed my Emily dog. Alas, poor sweet dog had epilepsy at the end of her dog days on Earth. 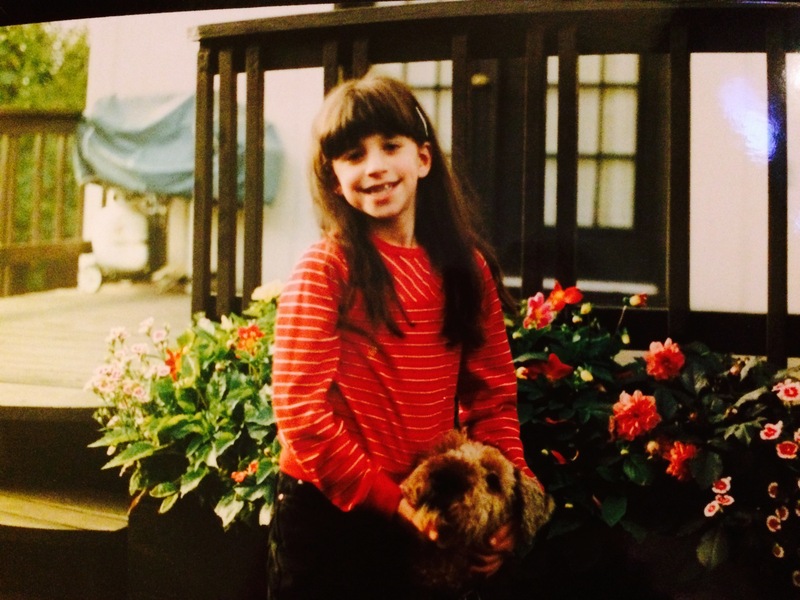 Her seizures were intensely scary and harmful. She was the best dog in our family and we still carry her with us today. Now Rex came lumbering into our lives on a dreary mid-autumn evening. I think I was probably five years old. He scared, well how can I put this gently…he scared the crap out of me. He was a 100 pound airedale who had been rescued by my mom’s friend and the rescue society in Anchorage. We became his new family instantly. He had the giant cone of shame people, a tube in his eye, and he weighed double my weight. After his healthy recovery, he became my steed and I his squire. I’d ride him. Yes, ride him around the house. When he was tired of carrying around a five year old he’d sit down and I’d slide right off. Wooooooop onto the wood floor. Rex was an important part of my life. He saw me through kindergarten, chicken pox, and countless childhood illnesses and frigid Alaskan winters. We buried our sweet dog in our backyard and marked his grave with a special post that Dad whittled for him. He’s near the beloved club house and in my mind’s eye, he will always be out in the back yard racing around, having a glorious time, snatching carrots from our garden hauls and running around like a mad, wild, free dog. Ari on the other hand, was my best friend. He was my dog, my fur faced baby. We were chums until the last day of his life. Debbie felt worried about me being alone in the house with only…our parents. 😉 She wanted me to have a buddy. And THE BEST buddy was brought into my life. Ari means lion in Hebrew, and I’m not sure how we happened upon the name during discussion, but it stuck. 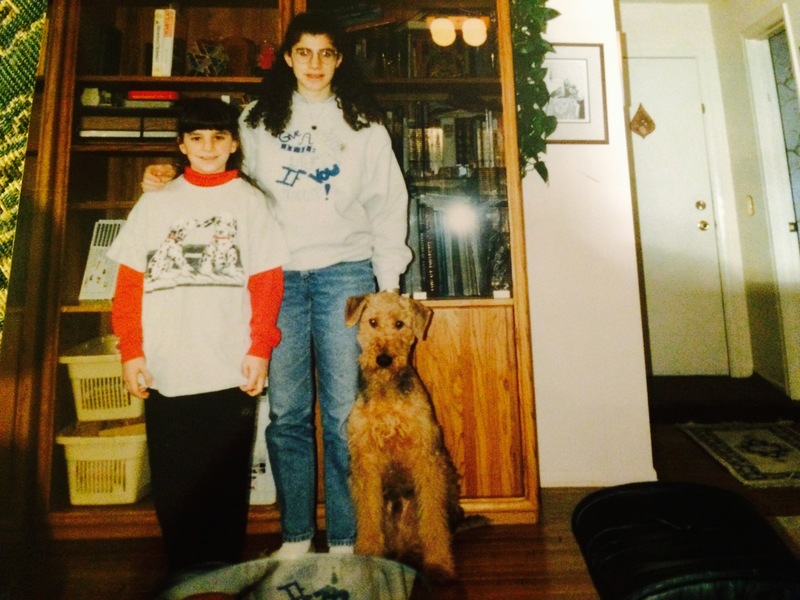 He was probably the most air-headed of all airedales, but he was also the most loveable. Poor dog ate anything and everything, as many airedales do. He ate part of his bedding one morning. He almost ended his life there but thank God for loving and supportive parents. He had surgery and the vet had to remove part of his intestines. Oy vey indeed. I remember crawling into the kennel at the vet’s with him to try and get him to eat some baby food. He refused to eat for everyone but me. He had, “Such a life,” to quote Mrs. Katz and Tush by Patricia Polacco. The last moments we all shared with him were surrounding him with love in the van bringing him to the vet, all of us together. He was snuggled into his bed, poor old puppy dog. 13 years was a long life for such a large dog. Maybe it was all the Jewish penicillin, chicken soup and chicken in his meals for years. Our mom fed him well. Needless to say, we’ve shared some really special furry friends Debbie. You know I love your Dulcie dog too. She was your first baby, and still is. She and I have a special bond, she even licked my nose after rediscovering our friendship while I visited you in Hong Kong. There is something about our furry beasts that connect us. We love them endlessly and oh the stories that were involved with each of them. I’ll save those for another time. I’ll leave you with this: Bella just gave me some long blinks, she must know I’m writing to you Debbie. From my fur cat baby to you, long blinks= I love you’s.